A mother whose son was attacked by a gorilla in 2004 after it broke out of its pen recalled painful memories this week. 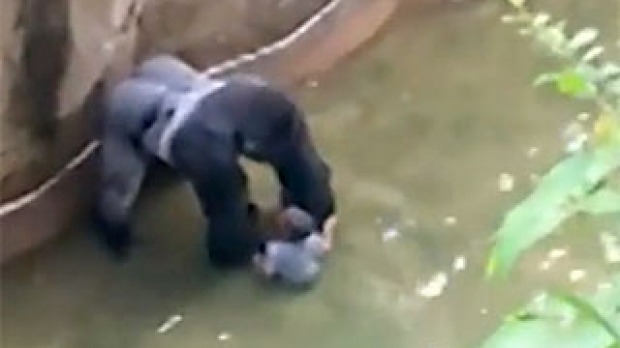 She said it’s quite difficult to watch the video of the 3-year-old boy who fell into an enclosure at the Cincinnati Zoo last Saturday. Keisha Armstrong and her 3-year-old son survived a similar encounter when they came face-to-face with a gorilla that escaped the Dallas Zoo. “I can only imagine what the mom is going through watching the baby being attacked,” Armstrong told Inside Edition this week. She said the gorilla attacked her and her son, Rivers. The gorilla mauled four people and was shot by cops. She was badly injured after fighting with the great ape. “He just bit down on my leg and it was the most excruciating pain that I have ever felt,” she told the show. Her son suffered a hole in his chest, a collapsed lung, and bite marks. “He just kind of picked him up like a rag doll,” his father, Amos, said. The boy was able to make a full recovery but still has scars from the attack.